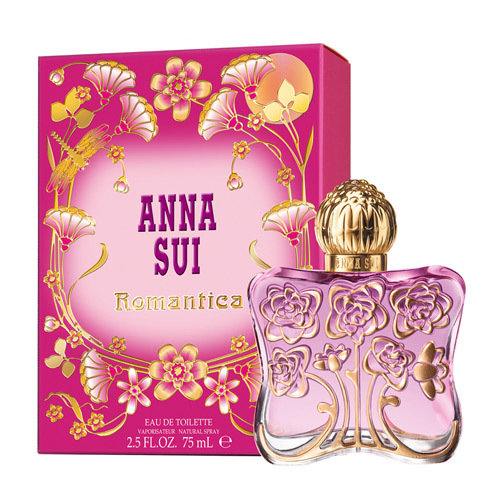 Anna Sui Romantica is refreshing and sparkling, romantic and playful. Anna Sui Romantica 75ml. EDT - Your soul wants to romance? Treat yourself to a true delight and pamper olfactory receptors with the new fragrance, created in 2015 by the American brand Anna Sui! Eau de toilette Romantica will give you a delicious floral and fruity nuances, opening easy and playful, sparkling like expensive champagne in an elegant glass. Juicy ripe mandarin and bergamot tart, deep red ripe sour pomegranate and grapefruit scented veil around you as soon as you breathe in the fragrance of a beautiful vial. Then around you like a bloom lush flower beds with shrubs roses and jasmine, peony and languorous fragrant lilies, sweet osmanthus, and a gentle breeze brings the fallen orange petals. Nearing completion, the perfume presents an exciting amber-musk accord on a strict tree background. Take a luxurious bottle Romantica - and immerse yourself in the romantic bliss! Romantica - refreshing and sparkling, romantic and funny women's floral-fruity aroma composition, invites you to stroll through the lush garden of fragrant. The aroma released in 2015 by the American fashion brand Anna Sui, and hidden in a charming pink bottle decorated on the side faces of the three-dimensional image touched with gold flowers and beautiful, like a bud ready to open a golden cap. The aromatic composition in the upper chord bestows a sparkling cascade of refreshing citrus notes of mandarin, Calabrian bergamot and grapefruit with woven into his delicate scent of ripe pomegranate. Heart chord reveals silky-spicy aroma of rose mask, delicate spice elegant pink peony, lily regal, shimmering, pungent notes of white jasmine, orange blossom honey, sweet smell of hydrangeas and warm spice osmanthus. Velvety spicy sandalwood, coniferous creamy notes Ceylon white cedar, exciting musk and amber phantom woven into a thin, silky aromatic plume final sound charming perfume.